A successful hospital evacuation requires time, labor-intensive resources, and support at levels that most healthcare facilities don’t possess for routine emergencies. Having evacuation tools, such as the PACE Evacuation Toolbox, readily available in every patient care area and training with DQE’s evacuation supplies will help hospitals have a standardized process in place to provide the smoothest evacuation possible. Hospital evacuation provides many challenges with maintaining the continuity of care during patient movement. Patient tracking and information management becomes difficult due to multiple hand-offs between clinicians. A hospital’s top evacuation priority is to maintain a high level of care for patients. That's why DQE created a new group of evacuation products that contain tools that organize a patient evacuation process, so evacuation is complete in a deliberate, orderly manner to help eliminate unknowns and limit liability. Visit DqeReady.com/Evacuation to view DQE’s full line of evacuation tools. PACE Evacuation Toolbox - PACE stands for Patient Assessment & Command Essentials. This toolbox is a flexible system that is designed to be easily integrated into your facility's existing evacuation capability. 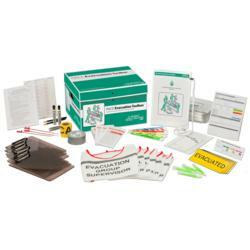 Its contents organize an evacuation response effort and include items that focus on patient preparation, incident management, and evacuation support. Patient Evacuation Go-Pouch - The Go-Pouch maintains continuity of care by consolidating vital information and supplies into one location. This gusseted Tyvek envelope holds a medical transfer bag, patient assessment door sign, and patient mobility level wristbands. Also included is the Go-Pouch clip, which secures the Go-Pouch to the patient, so necessary items stay with the patient throughout the evacuation process. HICS Vests - Evacuation Branch - Easily identify staff members of the Evacuation Branch with these HICS-style vests. The position names are printed on both the front and the back with a reflective strip sewn on both sides. Constructed of a non-woven, breathable synthetic material, these vests are durable enough for repeat use during evacuation training, but economical enough for disposal. Headquartered in Fishers, Indiana, DQE, Inc. designs and sells essential products that emergency responders depend on to enhance their jobs while saving lives. For additional information and to learn more about DQE and its family of products, visit http://www.dqeready.com.